I absolutely love this week's theme of Enforcing Independence! The oxymoronic nature of the theme is clear like so many of the other contradictions we see daily in the world of education. However, it is equally clear that one of our primary goals in schools is (or should be) to help students develop the skills to be independent learners. In order to help support students in the development of these skills, we need to ensure that the educators in our schools have learning experiences where choice and learning with others are the norm and not the exception. 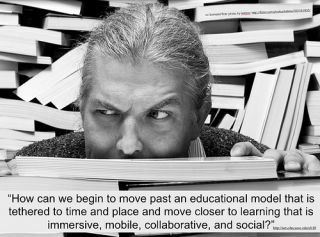 Thinking about what our students need to be prepared for a world where things are changing at a speed that is sometimes incomprehensible makes it clear that our educational model needs an overhaul. We are educating our children and attempting to equip them with the skills that will allow them to be able to compete for a jobs that have yet to be created. The problem for me (and I'm guessing other who were educated in a traditional setting) is that I sometimes lack the vision for what is possible. My own experiences as a learner are a severe impediment to my thinking when it comes to preparing meaningful learning opportunities for staff members. "People need to self-assess and self-remediate. They need to be able to say that they don't understand something and then be able to figure it out. There is no freedom until people can do this(unfortunately) we have crushed it out of our education system." "The point of professional development shouldn’t be in having teachers check off a box that they attended a session or watched a video or took on a project. And it surely shouldn’t be in having an administrator check off a box for them. The point of professional development should be in helping human beings--who in this case happen to be educators--become more fully engaged and connected with their peers and fellow professionals. The goal should be helping them to develop the profession themselves." One of the more concrete examples of this comes from Albermarle, VA where the district is making teachers the architects of their own learning. Their Seven Pathways to Ensuring Life Long Learning Capacities for Every Childis a great model for other school communities to employ to ensure a greater degree of independence for learners. As we plan our PD opportunities for next year, I look forward to the challenge of providing our staff with these types of learning experiences.